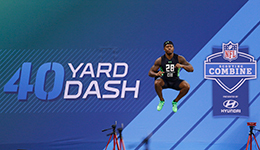 Updated: March 6, 2017 at 08:34 a.m.
Day 4 (March 6) of the combine workouts will feature defensive backs. Here are 5 of the most notable prospects to keep an eye on, and a look at which teams should be paying particularly close attention to them. Jackson is one of the most versatile and explosive players in the draft class. He is going to jump out of the stadium (he's the two-time Pac-12 long jump champion) and he should post a blistering 40-time. Jones is an outstanding cover cornerback and his ball skills should be on display during the field workout. He should be a top-20 pick this spring. Lattimore is my top cornerback prospect and he should test extremely well. He is very fluid, explosive and instinctive. Adams is one of the best safeties to enter the draft in the last five years. He is a dynamic athlete and I can't wait to watch him run/jump in Indy. Tabor has ideal size, length and ball skills. I'm anxious to see how well he runs. If he runs the 40 in the 4.4s, I think he'll be locked in as a top-20 pick. The Bears have added some quality pieces to the front seven over the last couple seasons but they have major needs in the secondary. The Saints offense is still in good shape with Drew Brees but they need to address their pass defense. This draft class is just what the doctor ordered. The Raiders have some young talent in the secondary but they need to add more bodies to the mix. I think they will have several intriguing cornerback options in the first round. The Eagles need to add a pair of cornerbacks and they are positioned to snag an elite player in the first round. The Titans have a very underrated defensive line but they need to add some speed and athleticism in the back end. They have two first round picks and I wouldn't be shocked if both of them were spent on secondary defenders.